Haitian-born film director Robenson Lauvince feels confident about his latest movie. He thinks it will help the Haitian film industry and the community as a whole. The Miami, Florida, premiere of Married Men follows closely behind President Donald Trump's reported insult of Haiti and other countries. He was said to have used a vulgar term to describe the countries during a meeting with lawmakers at the White House. 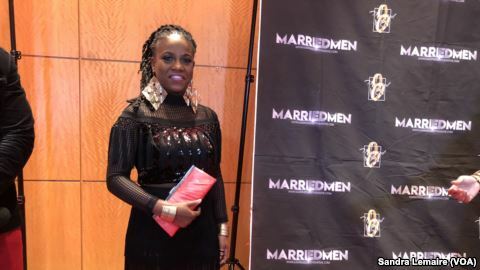 Haitian star Junior Rigolo has a small part in Married Men. He spoke during a press conference in Fort Lauderdale the night before the premiere. Married Men centers around Juno Rene, a therapist. He seems to have the perfect marriage. Then, he meets a woman for whom he is willing to risk everything. Director Lauvince spent five years making Married Men. He expressed excitement that it was finally opening. Lauvince said he was pleased by the Haitian American crowd that stood in line for hours to get tickets to the event. He said he and the audience need each other. Among the crowd was Miami-Dade County Commissioner Jean Monestime, the first Haitian-American elected to the commission. He said he puts a lot of responsibility onto Haitian American young people. He noted that they fit easily into American culture and have experienced the good that comes with entrepreneurship. Athlet St-Fleur, or Flav, is the lead actor in Married Men. It is his first film. But he already knows fame as a lead singer of the popular Haitian Konpa band Gabel. He says playing Juno was a huge responsibility. He credits his critically praised performance in the movie to the crew that surrounded him. “The director Robenson did a fantastic job, and also the whole team, Belgamee (productions). I hope people admire the character I play. I think some will hate him, but I hope some will admire him as well. There are a lot of good lessons in the movie, so I think people will receive it well,” he told VOA. Actress Belindja Eustache plays Chanel, a woman married to the main character’s best friend. Eustache was impressed with Robenson's work ethic on this film. He spoke about it at the movie premiere. “I think what’s happening tonight is a great example of what I was talking about in my Instagram post. Look at this amazing Haitian event. This is how Haitians should continue working so that other countries can see what we can do,” he said. The Married Men cast received a standing ovation when the movie ended. Sandra Lemaire wrote this story for VOANews.com. Caty Weaver adapted it for VOA Learning English. Hai Do was the editor.